Is there such thing as Too Much Chocolate Cake? Isn't this the sweetest little cake ever? I've already blogged about this great recipe but it is so good, it deserves another entry since I made it again in my new Nordic Ware mini-sunflower bake pan. This cake is so rich and so moist and absolutely loaded with thigh-loving calories. It needs no frosting or icing, just a huge cup of milk. I had leftover batter and used some mini pans that my sister Missy gave me (I think). I don't know what they are, frankly, but they worked! Check out the photos below of the bundt pan, the batter, and the cakes. 3. Bake for 50 to 55 minutes, or until top is springy to the touch and a wooden toothpick inserted comes out clean. Do not overbake so watch closely as your toothpick may insert into a melted chocolate chip. 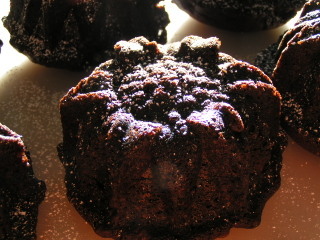 If using mini-bundt cake pans, bake for 35-45 minutes. 4. Cool cake thoroughly in pan at least an hour and a half before inverting onto a plate If desired, dust the cake with powdered sugar. This is a Flickr badge showing public photos from SassyPriscilla tagged with cake. Make your own badge here. wow that looks amazing. nope, never any such thing as too much chocolate cake! What a yummy-looking cake! Thank you so much for the recipe. I'm convinced we can never have too much chocolate.